Khloé Kardashian‘s 2018 is starting off on a glamorous note. The pregnant reality star lived it up on Sunday night, spending New Year’s Eve with boyfriend Tristan Thompson at the annual Le Bron James New Year party at the Mabel’s BBQ restaurant in Cleveland! She documenting the fun-filled evening on her Snapchat account. Kardashian, 33, seemed to be having a blast playing photographer, taking photos and videos of friends singing at the end of the evening as they presumably headed home, as well as one clip of her NBA-player beau busting a few celebratory dance moves. 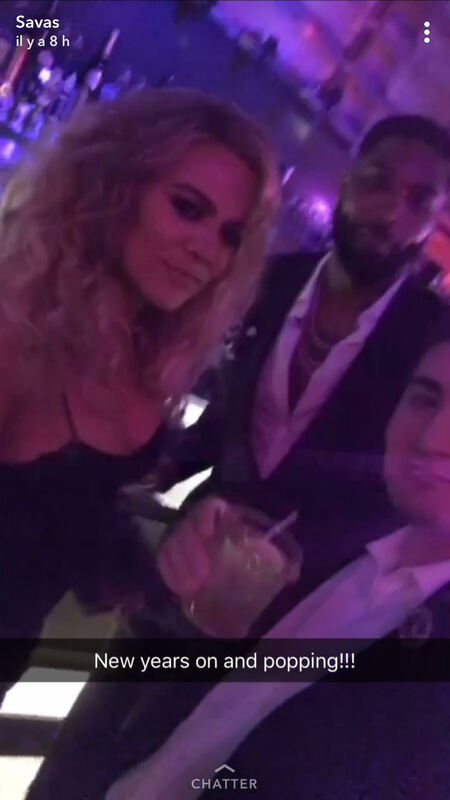 “He’s soooo handsome,” Kardashian wrote on top of a video of Thompson, 26, also sharing multiple clips of herself and her pals playing with Snapchat’s creative New Year’s face filters.